Relations of the political prisoners , seen on their way to Madrid to visit them ASSOCIACIÓ CATALANA PELS DRETS CIVILS. 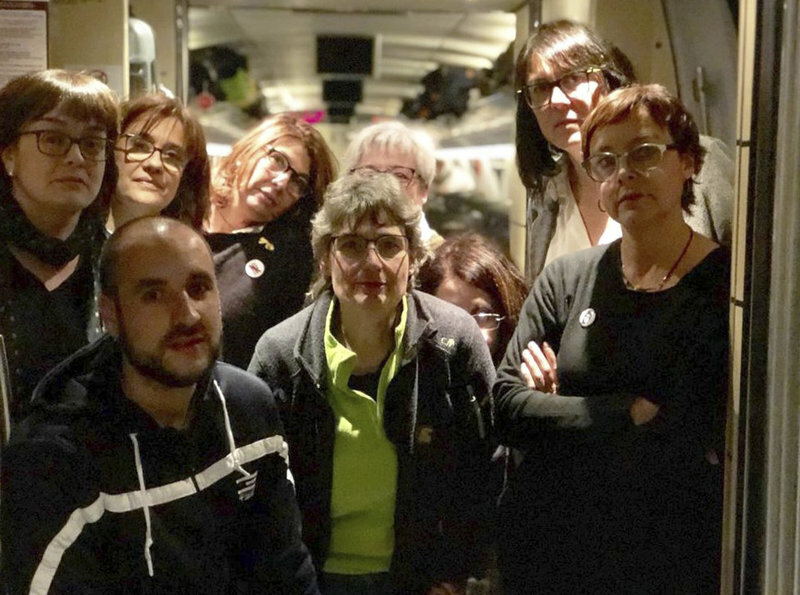 Despite it all, Dolors Bassa and Carme Forcadell are looking forward to being back together, albeit in the Madrid prison of Alcalá-Meco, after six months apart in separate Catalan prisons. “She was alone, so it was difficult”, says Bernat Pegueroles, husband of the former Speaker of the Catalan Parliament. It’s not as if the prisoners’ recent transfer to Madrid was a departure from home, though there were some homely advantages to their previous prisons. Whilst they were in Catalan prisons – Puig de les Basses, Mas d’Enric and Lledoners – they received more visits from family than they will during the trials in the Supreme Court, where they will be a 1400km roundtrip from their relatives. “Our mothers can’t see us nearly as often, in Madrid”, says Bassa, whose mother is 87 years old, and plans on attempting a monthly visit to Madrid. Forcadell’s mother, who is 90, will not be able to make the trip at all, sadly. Pegueroles, on the other hand, will attend the testimony of his wife in court, but does not want to hear the testimony of Guardia Civil agents who perpetrated violence against voters. Susanna Barreda, Jordi Sànchez’s partner, with her son Oriol, will occupy two of the chairs reserved for family members at the trial, for as long as she can take leave from work. Txell Bonet, the partner of Jordi Cuixart is less concerned about the logistics, than angered about the fact that the court has rejected several expert witnesses including Scotland Yard experts and international observers on the basis that their testimonies are “personal opinion”, whilst she believes they could clear their husbands.